The Environmental and Planning Law Journal is the recognised vehicle in Australia for the publication of high quality, in-depth reviews of all aspects of environmental law and policy. The Journal specialises in cutting edge analysis, providing well-researched articles that cover significant developments across the environmental spectrum, including climate change and the impact on corporate law. Coverage also includes integrated natural resources management; the ramifications of planning decisions; energy development; impacts on biodiversity; sustainability strategies; corporate liability and law enforcement; and environmental assessment. The Environmental and Planning Law Journal provides a forum for discussing these and other issues in light of the impact of regulation, policy, development of economic instruments, administration and reform. Dr Gerry Bates is an independent consultant in environmental law and policy who undertakes specialist courses at The University of Sydney and UNSW Australia. He has been honoured by the Law Council of Australia and National Environmental Law Association for his contributions to environmental law. 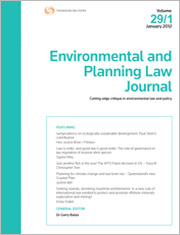 This Part of the Environmental and Planning Law Journal includes the following articles: “The Australian Experience on Environmental Law” – Brian J Preston; “Should Australia Introduce a Japanese Style Joint Crediting Mechanism?” – Dr Justin Dabner; “A Legislative Pigsty? The New Regime for Assessing and Managing Biodiversity Impacts Associated with State Significant Development in New South Wales” – Guy J Dwyer; “Designing Nature: Protecting the Australian Environment from Synthetic Biology” – Will Richards; “Challenging Decisions: Environmental Non-government Organisations’ Use of Judicial Review under the Environment Protection and Biodiversity Conservation Act 1999 (Cth)” – Nicola Silbert; and “Environmental Stewardship Duties in Biosecurity: Issues and Challenges” – Paul Martin and Natalie Taylor. This Special Issue of the Environmental and Planning Law Journal focuses on the regulation of pesticides. This Part includes the following content: “Special Issue Editorial: Regulation of Pesticides in Five National Contexts: The Need for a Paradigm Shift from Causation to Caution” – Professor Elisabeth Lambert, Dr Sally Knowles; “Constitutional Impediments to the Cooperative Framework for Pesticide Regulation in Western Australia” – Toby Nisbet; “Avoiding Conflicts of Interest: Compliance within Australia’s National Regulator of Pesticides” – Ann-Claire Larsen; “The Discord between International and Australian Approaches to Pesticide Regulation and the Precautionary Principle” – Mostafa M Naser, Toby Nisbet and Tanzim Afroz; “Pesticides, Disease, Causal Uncertainty and Standards of Proof: An Introduction to the Impact of Causal Uncertainty on Incapacitated Workers Seeking Compensation in Australia” – W Rupert Johnson; “Establishing Cause, What Does That Mean from an Epidemiological and Legal Perspective?” – J Oosthuizen and M Cross; “The Regulation, Control and Management of Pesticides in Singapore” – Lye Lin Heng; “A Critical Analysis on the Legal and Institutional Frameworks on Pesticides in the Philippines” – Rose-Liza Eisma-Osorio; “Permitting Poison: Pesticide Regulation in Aotearoa New Zealand” – Catherine J Iorns Magallanes; and “Pesticides Law and Precautionary Principle in Canada: Does the Entanglement of Federal and Provincial Rules Adequately Protect Us from Environmental and Health Risks?” – Marc-Antoine Racicot. This Part of the Environmental and Planning Law Journal includes the following articles: “Does the ‘One-Stop Shop’ Need Refurbishing? Evaluating the Review Jurisdiction of the NSW Land and Environment Court – Christopher Pearce; “Offsetting Cultural Heritage: Lessons from the Theory and Practice of Biodiversity Offsets” – Robert Holbrook and Professor Jan McDonald; “The Assessment of Flooding Risks in the Courts: Seeds of a Divergent Jurisprudence” – Dr Philippa England; “Australian Government’s Ongoing Challenge to Achieve Fuel Efficiency Standards by 2025 Can Impact on 2015 Paris Agreement” – Anna Mortimore and Hope Ashiabor; “It Is about Time: Understanding the Textures of Time in Australian Environmental Law” – Benjamin J Richardson; “Public Participation and the Adani Syndrome” – Dr Noeleen McNamara and Dr William Crane; and “Evaluating the Governance Potential of Voluntary Stewardship Programs for Farmers” – Andrew Lawson and Paul Martin. This Part of the Environmental and Planning Law Journal includes the following articles: “Emergence of the Soil Conservation Act 1938 (NSW): The Origins of a Co-operative and Voluntary Regulatory Approach to Landcare on Private Land 1884–1938” – Judith S Jones; “Adapting to a Sustainable Energy Future – Part 2: Regulating Wind Energy Development under the NSW Planning Law Regime” – Brian J Preston and Tristan Orgill; “Suggested Improvements to the Australian Environmental Impact Assessment Process to Benefit Marine Megafauna” – Rachel A Groom, Kerry M Neil and Helene D Marsh; “Moving from Confusion to Cohesion: An Analysis of the Legislative Framework of Wetland Conservation in Western Australia” – Toby Nisbet, Vic Semeniuk, Chris Semeniuk and Margaret Brocx; “Coastal Climate Change and Transferable Development Rights” – John Sheehan, Andrew H Kelly, Ken Rayner and Jasper Brown; and “Sustainable Development – A Review” – Serge Killingbeck.